FRIENDS AND PARTNERS OF CATA, For 26 years, CATA’s mission has been simple: to create a vibrant and inclusive community through the arts. Through countless workshops, performances, art exhibits and dance solos, one thing has never changed: your support makes CATA possible. Dominic Williams (Lee High School) with his painting that was sold at the Clark Art Institute. Your generosity came to life in 2018 in so many ways. Because of you, Katrina, a CATA artists whose disability makes it difficult to hold a paintbrush, created breathtaking paintings using an adaptive technique that lets her bring her ideas to life. Because of you, Jane, a woman with Alzheimer’s at a local nursing home, reconnected with her life stories through poetry and music. And because of you, David, a CATA actor and drummer, had a stage and a spotlight to share his incredible talents with our community. There are hundreds of CATA artists who experience the power of your support every day. CATA’s vision of inclusion takes work. And it wouldn’t be possible without people like you who have stood by us. Whether you’ve been supporting us for 26 year or just gave your first gift, you are making a big impact for hundreds of people with disabilities. You’re making incredible creativity possible. Through dynamic arts workshops and public events, you’re helping CATA artists with disabilities tap into their potential, explore new talents, and share their unique points of view. Margaret and CATA artist Maria Netti (from United Cerebral Palsy of Berkshire County) with her painting at the Clark Art Institute. Life-Changing Arts Workshops Because of you, in 2018 CATA reached more people with disabilities than ever before. That means more CATA artists explored their creativity and connected with their community. You gave Jane Cole (Riverbrook Residence) an opportunity to express her creative spirit in CATA’s visual arts workshop. From painting, dance, theater, and singing, to drumming, juggling, yoga, and creative writing, you brought life-changing arts workshops to 732 people with disabilities. Thanks to you, over 150 students with disabilities in area public schools found their creative voice. You helped Cory Gagliardi (BCArc) explore new rhythms in CATA’s World Music & Drumming workshop. You supported over 100 adaptive A.R.T. workshops, allowing CATA artists with significant physical disabilities to reveal talents that might otherwise have remained hidden. 270 ELDERS INSPIRED You gave inspiration to more than 270 elders through transformative encounters with CATA’s Art Cart program in area nursing homes. Extraordinary Performances, Groundbreaking Exhibits You brought CATA artists into the community through sold-out performances and bold new art exhibits, connecting more than 26,000 art lovers with CATA artistry. ANNUAL PERFORMANCE WEEKEND SOLD OUT You put the talents of our CATA artists on stage for two sold-out performances at Shakespeare & Company. And you gave 70 students the chance to experience the power of art and inclusion at our dress rehearsal. Your support meant that Peter (BCArc) had a chance to see his artwork on display at the Lichtenstein Center for the Arts. ART SALES & EXHIBITS SOARED You gave CATA visual artists a spotlight with major exhibits at the Clark Art Institute and the Lichtenstein Center for the Arts, as well as year-round Art on Tour exhibits at Hudson Hall, Good Purpose Gallery, The Mount, and more. You gave our writers a chance to shine at our third Annual Poetry Reading at The Mount. And you put CATA artists in print by publishing our first-ever art and poetry book! You took CATA’s Moving Company to the Massachusetts State House to share their original choreography with new audiences. And because of you, art sales soared with 87 pieces sold. That’s over $19,000 in sales, creating commissions for CATA artists! Teresa Thomas and Natasha Lorrick perform with The Moving Company in CATA’s Annual Performance at Shakespeare & Company. ○ Acknowledges donors who have given to CATA for 5 or more fiscal years in a row. Fiscal Year = Sept 1 - Aug 31. This list reflect all gifts from Sept 1, 2017 - Aug 31, 2018. Please let us know of any errors or omissions. Thank you also to those generous donors who gave between Sept 1 and Dec 31 – you’ll be on our next list in our Gala program! ○ Gorham & Norton Inc.
You brought CATA programs to a whopping 49 partner organizations—residences, day programs, and schools across Berkshire and Columbia counties. Your support is building a strong and sustainable future for CATA. In 2018, we began an intensive planning process exploring a new home for CATA so we can serve more people with disabilities—supported by you, our donors, and by a competitive grant from the Massachusetts Cultural Council’s Cultural Facilities Fund. CATA’s selection by the Barr Foundation and The Klarman Family Foundation for the BarrKlarman Massachusetts Arts Initiative also marks a major turning point for us. It’s a ringing endorsement of CATA’s work and a testament to donors like you who are supporting cutting-edge, inclusive arts programs. STAY TUNED FOR MORE EXCITING NEWS ABOUT CATA’S PLANS FOR A NEW HOME! CATA artist Cathy Lemay (BFAIR) poses proudly with her artwork at the Clark Art Institute. To every CATA supporter and partner — thank you! You have transformed our community and brought creative expression to hundreds of people with disabilities. In 2018, we celebrated 25 years of a balanced budget, and either met or exceeded targets in all income categories. Because so many of the people we serve have limited incomes, CATA turns to donors to support our work: contributed income makes up 74% of our budget. Support for CATA grew in 2018, with 678 donors contributing. 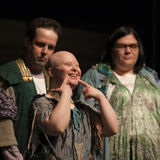 The vast majority of CATA’s expenses are directed to our programs serving artists with disabilities. Your contributions are critical to sustaining the workshops, exhibits, and performances that provide life-changing opportunities for CATA artists. CATA deliberately worked to create a surplus in 2018 in order to jump-start funding on an intensive facilities project that will be announced soon. 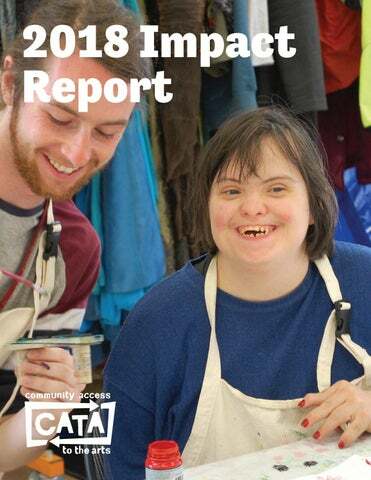 Community Access to the Arts 40 Railroad Street, Suite 6 Great Barrington, MA 01230 margaret@CATAarts.org 413-528-5485 CATAarts.org Front cover: Zach Van Wort works with CATA artist Sarah Vannah (BCArc) in the CATAdirect Crafts Cooperative.